Breaking news. This just in. 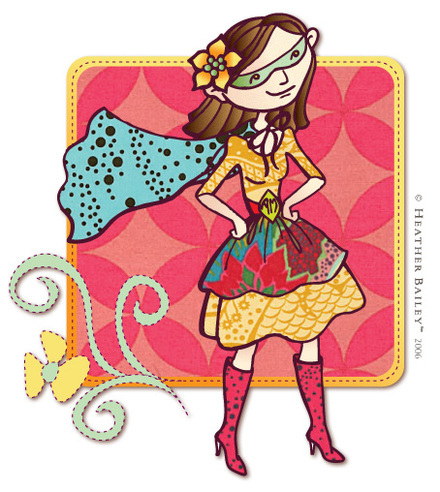 The true identity of Miss Amazing, Domestic Superhero has been revealed… and she’s started a new, tell-all blog. Oh my goodness, I’m so excited to introduce you to Anna Maria. Not only does she make the coolest things and have a fab kitchen, but she’s also a fellow fabric designer and mother of five. 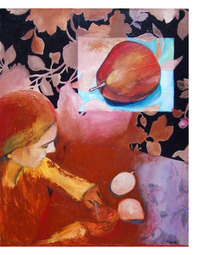 Check out her incredible painting, “new mother peeling pears,” and this happy little car. 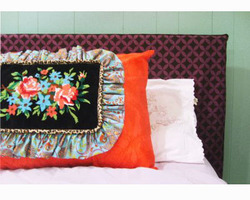 Ooo, and the pillow! What a range, huh? We’ve been pretty chatty with the emails this week and I tell you, you’re going to love this girl. So, go say “Hi” to Anna Maria. Word is, she lost a battle with a pencil today and had to visit the emergency room. Tough work, being a Domestic Superhero.